Our glow in the dark photo luminescent egress tape is a smooth marking tape that can be used in many areas to highlight obstacles in lights out situations. These can be literally anything! Stairways, doorways, walkways and door surrounds. 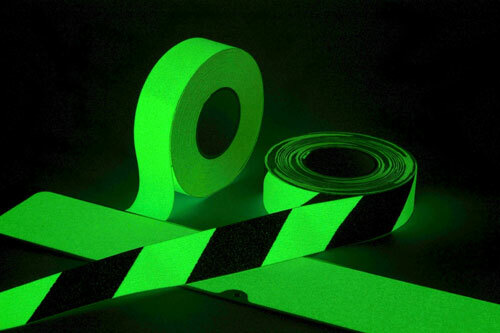 Glow in the dark photo luminescent Hazard tape is a SMOOTH HAZARD marking tape that can be used in many areas to highlight obstacles in lights out situations. These can be literally anything! Stairways, doorways, walkways and door surrounds. Glow in the dark photo luminescent egress tape is a SMOOTH marking tape that can be used in many areas to highlight obstacles in lights out situations. These can be literally anything! Stairways, doorways, walkways and door surrounds.